YouTube, Facebook and Apple have taken steps to remove content associated with InfoWars and its founder Alex Jones. Each social media platform said Monday that it had removed content from Jones or InfoWars because it had violated their policies. The companies' moves shut down key distribution channels that had given the controversial media figure easy access to millions of internet users. "When users violate ... policies repeatedly, like our policies against hate speech and harassment or our terms prohibiting circumvention of our enforcement measures, we terminate their accounts," said a spokesperson for YouTube. Some channels for some of InfoWars' top personalities were still on the platform, however. InfoWars did not respond to a request for comment. But in a message posted Monday on Twitter, Jones encouraged users to access live streams directly from the InfoWars website. He described it as "the one platform that they CAN'T ban." The social media platform said in a statement that it had "unpublished" the Alex Jones Channel Page, the Alex Jones Page, the InfoWars Page and the Infowars Nightly News Page. Facebook (FB) removed four videos from the pages last week after determining that they violated its hate speech and bullying policies. It also suspended the personal profile of Jones. The company said that more content from the pages had since been reported, and it had decided to remove them for "repeated violations of community standards and accumulating too many strikes." "Upon review, we have taken it down for glorifying violence ... and using dehumanizing language to describe people who are transgender, Muslims and immigrants, which violates our hate speech policies," said Facebook. The pages displayed the following message when accessed Monday: "Sorry, this content isn't available right now." Facebook said the page administrators would be able to appeal its decision. In the absence of an appeal, or it the appeal fails, the pages will be permanently deleted. 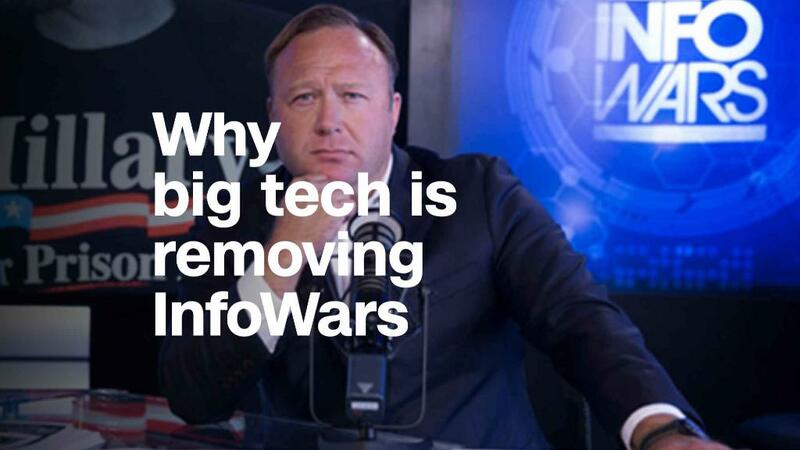 The moves by Facebook, YouTube, and Apple left Twitter as the only major tech platform not to take some action against InfoWars and Jones over the past day. A Twitter spokesperson told CNN that neither InfoWars nor any of its associated accounts are currently in violation of Twitter rules. "While much of the discussion around InfoWars has been related to false news ... none of the violations that spurred today's removals were related to this," it said in a statement. "Apple does not tolerate hate speech, and we have clear guidelines that creators and developers must follow to ensure we provide a safe environment for all of our users," it said in a statement provided to BuzzFeed News. — Paul P. Murphy and Oliver Darcy contributed reporting.